Popular Package deals available for FULL-DAY ADVENTURE PASSES. Buy one of our full-day adventure passes and get one guided activity plus your choice of a self-guided activity! 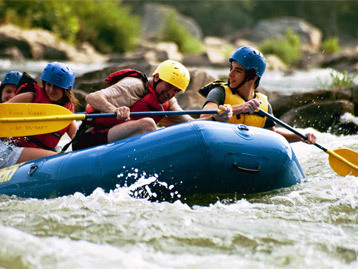 The adventure pass allows participants to participate in a full day of activities at River Riders, consistently ranked as the #1 Outdoor Activity in Harpers Ferry on Trip Advisor for the last 10 years. Choose your guided activity from rafting, and ziplining, or tubing first. In the afternoon participate in up to 2 hours on the Adventure Park and/or Potomac Play Pass as time allows. Now that's a day of adventure the whole family can enjoy!